Read it out loud to get the joke. It isn’t that funny, sadly, but it made me laugh when I thought of it. The specific tRNA in the image is yeast Phenylalanine tRNA, which I got from RCSB. The number is 1ehz. 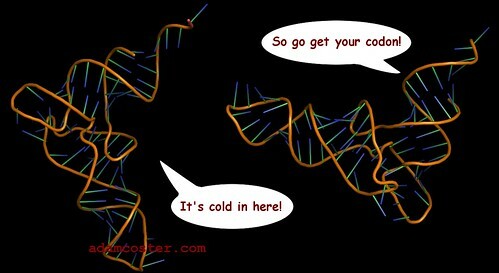 I used pyMOL to orient and take the images, and then GIMP to add in speech bubbles. Next > Ye Olde Halfe Life. And a Gnome.